Welcome to The Abso!ute Sound online! We explore music and the reproduction of music in the home. We believe that the sound of music, unamplified, occurring in a real space is a philosophic absolute against which we may judge the performance of devices designed to reproduce music. Our goal is to provide the resources consumers need to judge how a component's sound either honors or departs from the music's truth, and to make sound purchasing decisions that maximize their experience of reproduced sound. Below is our Issue 239, January 2014 table of contents and editorial. Robert Harley premieres the first copies of TAS' new book. 47 TAS Product of the Year Awards: We name the very best products of 2013. Neil Gader on a modern version of the most popular amp in high-end history. The mavens of AC power products trickle-down their technology to a popular price point. Neil Gader has the good news. Yes, that JansZen. The legacy of Arthur Janszen, author of the KLH Model Nine, lives on in his son David's all-new zA2.1 electrostatic hybrid, says Robert E. Greene. PLUS! A special except from The Absolute Sound's Illustrated History of High-End Audio on "Arthur Janszen and the KLH Model Nine." Chris Martens listens to this remarkable headphone amplifier with a fascinating design inspiration. Don't call it a "subwoofer." REL's new Serie R-528SE is a "Sub-Bass System," and there's a difference, says Paul Seydor. This highly flexible integrated amplifier and DAC will take your system wherever you want to go — with plenty of power, to boot, says Wayne Garcia. It may be an oxymoron to call a digital-to-analog converter the "Analog DAC," but the name tells you everything you need to know about the sound of MSB's most affordable product. Vade Forrester reports. The late, fabled founder of sonus faber has produced a masterpiece in the Accordo, says Neil Gader. Jacob Heilbrunn puts these interconnects, AC cords, and phono cables from Japan's Furutch through their astounding paces. Robert E. Greene evaluates this strikingly high-resolution, low-distortion, German-made ceramic-driver floorstander. One of high-end's greatest designers has created his best work in the new Momentum preamplifier and Momentum monoblock amplifiers, says Anthony H. Cordesman. Yes, they're expensive, but, according to Jacob Heilbrunn, Transparent's XL Reference Digital Link interconnects are essential to realizing state-of-the-art digital sounds. Jacob Heilbrunn auditions this flagship loudspeaker from one of high-end audio's most venerable companies. It's not every day that you come across something substantially new in preamps and power amplifiers, but "new" is the only way to describe Siltech's SAGA System. Jonathan Valin takes an in-depth look at this revolutionary product. 98 Audio Desk Systeme Vinyl Cleaner: Robert Harley takes a listen to an amazing record cleaner. 182 CH Precision Electronics: Alan Taffel auditions three jewels from Switzerland. Jeff Wilson reports on two new labels issuing LPs of jazz rarities by American musicians recorded in Europe. Our Art Lingten has an amazing gift: He can tell what piece of music is on an LP simply by looking at the grooves! Elvis Costello and The Roots, Matthew Sweet and Susanna Hoffs, Janelle Monae, Ry Cooder, Allen Toussaint, the Raya Brass Band, and Rebecca Frazier, plus a 4-LP box of Fleetwood Mac. Bizet, Elgar, and Vaughan Williams from Reference, bassoon bonbons from 2L, Duke Ellington's Nutcracker from Harmonia Mundi, and Dudamel conducting Strauss from DG. The latest by Carla Bley, Fred Hersch, Dave Holland, Ira Sullivan, Myra Melford, and Cécile McLorinSalvant. 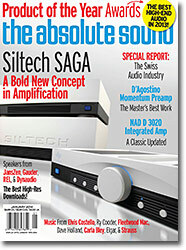 232 Back Page: We talk with Klaus Bunge of Odyssey Audio.